The poet of Havana, directed by Canadian filmmaker Ron Chapman, attempts to summarize the story of thirty years of career of Cuban singer-songwriter Carlos Varela, taking as its starting point two concerts that took place in early 2014 at the National Theatre of Havana. 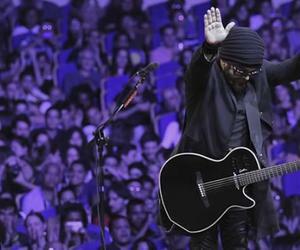 In those concerts were invited some important colleagues of Carlos Varela as Jackson Browne, Ivan Lins, Luis Enrique, Juan and Samuel Formell, Eduardo Cabra, José Luis Cortés, X Alfonso, Diana Fuentes and Alexander Abreu, among others, to celebrate this significant milestone in his career. Among all the voices of the documentary highlights the American singer-songwriter Jackson Browne, who has included in his latest album Standing in the Breach, a song by Carlos Varela. Through revealing interviews with various personalities not only music, but also film, theater, television, radio, literature and academia, The poet of Havana tells the personal and professional story of the author of anthological themes as Guillermo Tell, Jalisco Park, Memorias and Una palabra, but also that of a whole generation that found in the songs of Varela a unique way to express their feelings and concerns.